Within Teamwork Projects, you can choose to skip weekends in the Gantt Chart so that start and due dates do not land on weekends. When you enable skip weekends, weekends will be hidden within the Gantt chart, and any tasks with start or due dates, or milestone dates landing on weekends, will be pushed to the closest available weekday. Note: While the tasks will be shown to fall on weekdays in the Gantt chart, the actual start and due dates of the task will not be altered. To enable skipping weekends, select the Settings option at the top of the Gantt chart to view the general settings. In the Settings area, you will see an option to Skip Weekends. Toggle this on to enable it. Once you have enabled it you will see the following message if you have project items falling on a weekends. If you have project items that have been updated automatically, those changes will not be applied until you save changes on the Gantt chart. This gives you an opportunity to preview the changes that will be applied before clicking save. 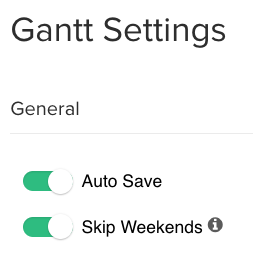 When you enable Skip Weekends and have Auto Save switched on, next time the Gantt chart attempts to automatically save changes you will be reminded that tasks have been updated so you can choose to accept those changes. When enabled, task and task list durations are calculated excluding the weekends. When moving or resizing tasks or task lists, the Gantt chart maintains the duration, while modifying the start and end dates, so that they fall on a business day. Tasks, task lists and milestones which start and end on the same weekend are displayed as one day items on Monday of the following week. The skip weekend preference is saved on a per project basis and if it is toggled on then it will be enabled for all project users. Only administrators can enable the setting. Note: Teamwork defines a weekend as Saturday and Sunday.